What if I told you if you could make arguably the coolest action figure accessory ever with a paper clip, some kite string and a little solder. With a little work you can create your own grappling hook scaled for your kids Power Rangers, GI Joes or Barbies. Yeah you bet Barbie needs a grappling hook when she’s raiding Skippers compound. The bottom line is that homemade toys don’t have to be lame sock puppets or coffee cans filled with beans. For the grappling hook itself you will need a single Jumbo Paper Clip. This is merely the larger of the two styles of common paper clips. 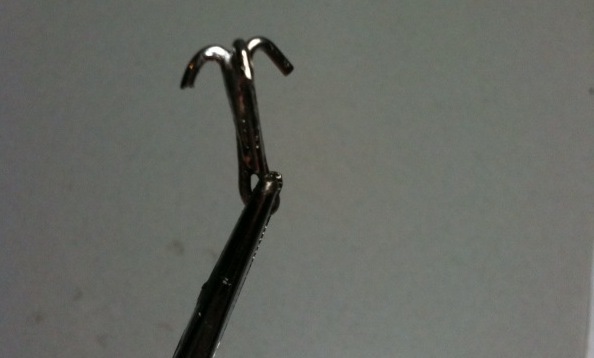 You could use a smaller clip in a pinch but the thicker gauge of the jumbo paper clip is better suited for grappling. You will also need some form of string or fishing line. I like to use nylon kite string as it’s very strong, and looks great attached to the hook. It doesn’t take much, but the two items you absolutely need are a pair of needle nose pliers ( a Leatherman or other multitool will work very well) and a soldering iron. If you don’t have a soldering iron I believe you need one. You never know when you’ll need to tin some speaker wire ends, fix a loose solder joint on your kids toys or burn holes in plastic. You can get by with a cheap $9 soldering iron from Radio Shack. Worse case borrow one from a friend. You’ll need some solder to go with your iron. Some helpful but optional tools are a pair of diagonal cutters and some helping hands, clay or silly putty for holding the clip while soldering. 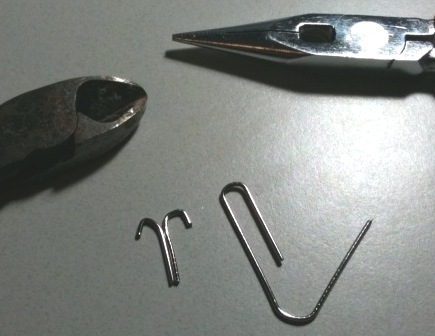 First you need to form a small loop with your pliers make the shaft of the hook about 3/4 of an inch and then loop the clip back on it’s self and finally form another loop modeled after the picture above. Cut the remaining clip off with your diagonal cutters. Take a look at my rudimentary drawing to see the two components you will make. You can easily scale the size however you want, your smurfs will use a much smaller hook than your Cabbage Patch Kids. Now you need to make the 3rd hook of the grapple merely form a half loop and cut the end off the clip again reference the drawing. You’ll want it to be slightly shorter than your loop in the first piece. That’s where you’ll tie off your string. Get your soldering iron heating up. If it’s got a variable temperature setting you’ll want to set it relatively high the paper clip is pretty thick so it will take a bit of heat to get the solder to flow. It’s helpful to use something like some “helping hands” to hold the double looped hook to prepare for soldering. If you don’t have something like that you can use some alligator clips or another pair of lock nose pliers, even clay or silly putty will work. Heat up the shaft of the hook and flow some solder into the gap between the two sides. Get a good amount in there you’ll use that to attach the single hook. Now that you’ve got some solder in there get it flowing again by putting your iron on the shaft, when it starts to flow again with a pair of pliers carefully put the single hook into place. This may take a few tries, don’t get discouraged you’ll get it. Now all that remains is to attach the kite string to your grappling hook. An improved clinch knot knot works well, and also if you are using nylon line you’ll want to melt the ends of the string so it doesn’t unravel. You can use your soldering iron for that, plus you get to melt stuff. 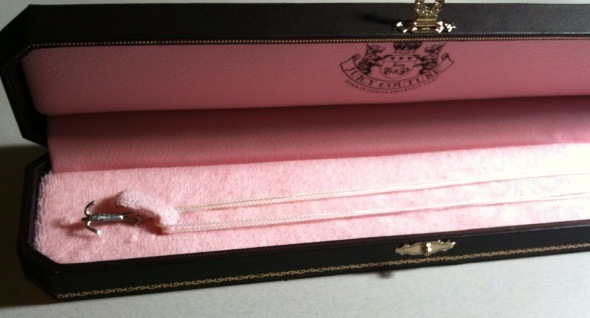 Now you may not have a sweet Juicy Couture box like I found at a garage sale for free but I’m sure you can find some form of necklace box, try a thrift store or your grandma’s closet. That’s the part that’s going to give your homemade toy a real nice touch. I can speak for my kids when I tell you that they love them. Now get to it and I won’t tell anyone that you’re pretending your Edgar from the Deadliest Catch trying to snag your king crab pots. That’s hilarious! 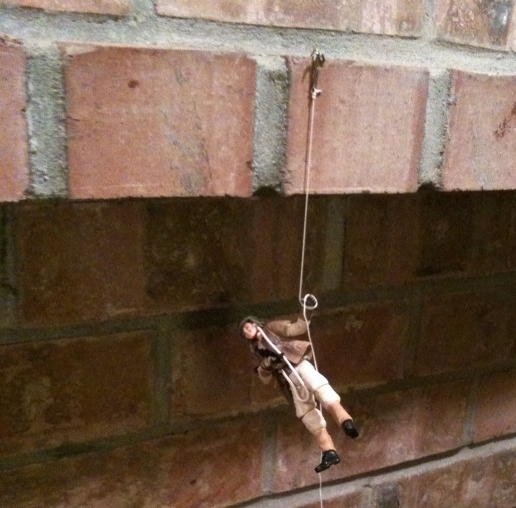 Wish I thought of this when I was younger, my Star Wars guys would’ve loved it! .-= Jason @ Redeeming Riches´s last blog ..7 Milestone Birthdays That Affect Your Retirement =-. My wife and I are “trying” to have children now, and we have made a commitment not to buy any new items if we are blessed with any babies. Instead we are going to use all recycled baby equipment from all the other members of our family who have recently had children of their own. This idea of DIY children’s toys will be one that I employ… big time. .-= Matt Jabs´s last blog ..Spending Filters ““ How I Save Money On Just About Everything =-. Kids are easy to entertain, especially boys. Something simple like this can have them going for hours. Good tip. Great idea Paul! It reminds me of the time my wife and I bought our neices some fancy toys for Christmas, wrapped up in big boxes. The kids opened the boxes, tossed the toys, and played with…the BOXES! I can’t even remember what we got them, because the box caper stole the show. Kids aren’t always interested in fancy stuff, sometimes the most basic things will do just fine. .-= [email protected]´s last blog ..The “Boring” Benefits of Staying in Your House and Paying Off the Mortgage—PART TWO =-. The boys do like them! Even if they aren’t playing with their action figures, they were trolling around their messy bedroom trying to see what they could pick up off the floor. I think the only thing they would like more are real sized grappling hooks so that they could try to climb up the side of the house. .-= Len Penzo´s last blog ..Drive-By Movie Review: Duplicity =-. I’ll be over shortly Len…Cobraaaaa!!!! That is truly the coolest! Where the hell was this when I was 10 years old I would have been entertain for at least a week. The presentation is everything !!! You gotta warn that most solder has lead in it . Warn them about choosing right kind. And you know how it affect developing brains. I received my first mortgage loans when I was 32 and that supported my family a lot. However, I need the student loan once again.